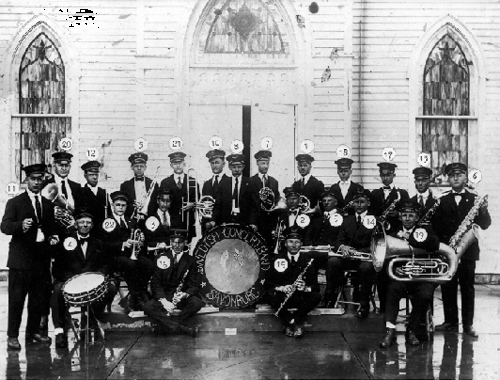 A photograph of the Swedish Concert Band posed in front of the Friends Home Evangelical Lutheran Church, Savonburg, Kansas. Members of the band are: 1. George Ahnlund, 2. Conrad Erickson, 3. Olaf Gerdin, 4. Evan Holmes, 5. Gilbert Holmes, 6. John Holmes, 7. Clarence Johnson, 8. Oliver Johnson, 9. Wilber Johnson, 10. Robert Larson, 11. Harry Lindberg, 12. Julius Lindberg, 13. Verle Nelson, 14. Arthur Nystrom, 15. Martin Oberg, 16. A. E. (Abe) Olson, 17. George Olson, 18. Merrill Olson, 19. Arthur Sellegren, 20. Grover Sellegren, 21. Robert Sellegren, 22. Emery Vance, and Arthur Westerberg (not in photo). This image shows Swedish culture and music from the 1920s and can be used to discuss traditions and history of Swedish immigrants.